A man clambers onto the streetcar after having bought the daily paper and tucking it under his arm. Half an hour later he gets off, the same newspaper under the same arm. Only now it's not the same newspaper, now it's a pile of printed sheets which the man drops on a bench in the plaza. It hardly stays alone a minute on the bench, the pile of printed sheets is converted into a newspaper again when a young boy sees it, reads it, and leaves it converted into a pile of printed sheets. It sits alone bench hardly a minute, the pile of printed sheets converts again into a newspaper when an old woman finds it, reads it, and leaves it changed into a pile of printed sheets. But then she carries it home and on the way home uses it to wrap up a pound of beets, which is what newspapers are fit for after all these exciting metamorphoses. In the parlance of media research, the copy of the newspaper in the story had three readers per copy. But this is getting ahead of the story. Our intention here is not to offer a meditation on the life and death of a newspaper copy. Rather, we wish to provide a dispassionate analysis of the economics of newspaper publishing. Newspapers have two principal sources of income. The first source of income is the newspaper sales. Thus, the man in the story paid the kiosk operator for that newspaper. After subtracting the commission for the kiosk operator (with further deductions by an intermediary distributor, if applicable), the newspaper receives the sales revenue. If this were the sole source of income, the newspaper publisher would be forced to price the newspaper at a profitable rate. The gross profit would be a function of the circulation, defined as the total number of copies that were sold. In practice, newspapers are often priced at unprofitable rates. In fact, some newspapers are even distributed for free. How is this possible? This is because the newspaper publisher can count on advertising as another source of revenue. For the purpose of setting advertising rates, the trading currency is not just the circulation, but the total number of readers. As the story demonstrates, a single copy of a newspaper can be read by more people than the original purchaser. The total number of readers is usually established by some form of consumer survey. On one hand, a large number of readers will bring in large advertising revenues, which enables the newspaper publishers to set lower copy prices and/or improve editorial content, which attracts more readers. On the other hand, a smaller number of readers will result in low advertising revenues, which forces the newspaper publishers to set higher copy prices and/or reduce pages, which loses more readers. So it is a delicate balancing act that the newspaper publisher must play. We will now cite some consumer survey data. Since our quotation comes from Julio Cortázar, who was the quintessential porteño living in Paris, it is appropriate that we will refer to the TGI Argentina survey. Within this survey, a total of 9,097 persons between the ages of 12 and 75 years old were interviewed in the Gran Buenos Aires area during the year 2000. Each respondent was asked about the reading of the local weekday newspapers: Ambito Financiero, Clarín, Crónica Matitutina, Crónica Vespertina, Diario Popular, La Nación, La Razón, Diario Olé and Página/ 12. Each reader was then asked about the method by which he/she obtained the copy of the newspaper. 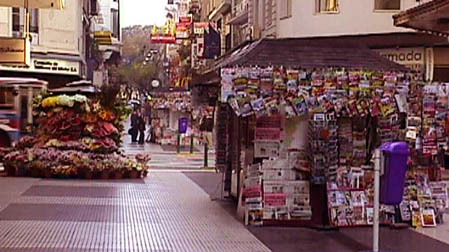 Across the nine Buenos Aires-based newspapers, an average of 42.8% of newspaper readers said that they personally purchased the newspaper from a kiosk or store. The sum total of 42.8% + 12.5% + 9.7% = 65.0% of newspaper readers constitutes the so-called primary readers. The other newspaper readers obtained the copy at work, school, and public places (such as doctors' offices, hairdressers' salons, libraries, etc); received free copies; borrowed someone else's copies; found a copy left behind by someone; or by some other means. Collectively, they are referred to as secondary readers. If 65% of newspaper readers are primary readers, that still does not mean that the total number of readers is equal to the circulation divided by 0.65. Rather, the diffusion process is as follows --- a copy of a newspaper reaches a household, in which one person and possibly more persons (but not necessarily all persons in the household) read it. All readers within that household are classified as primary readers. Therefore, the number of primary readers per copy is bounded between the minimum of one and the maximum of the total household size. On top of the primary readers, we can add the number of secondary readers in order to obtain the total number of all readers.